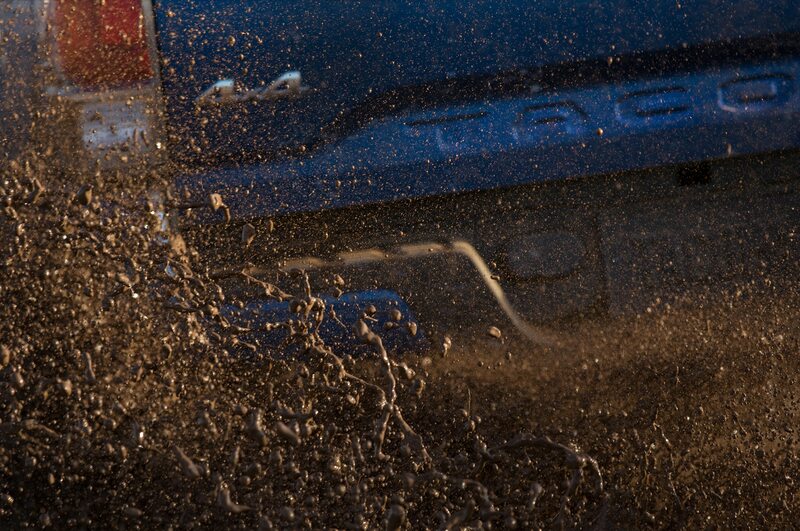 If it ain’t broke, just fix it up some. 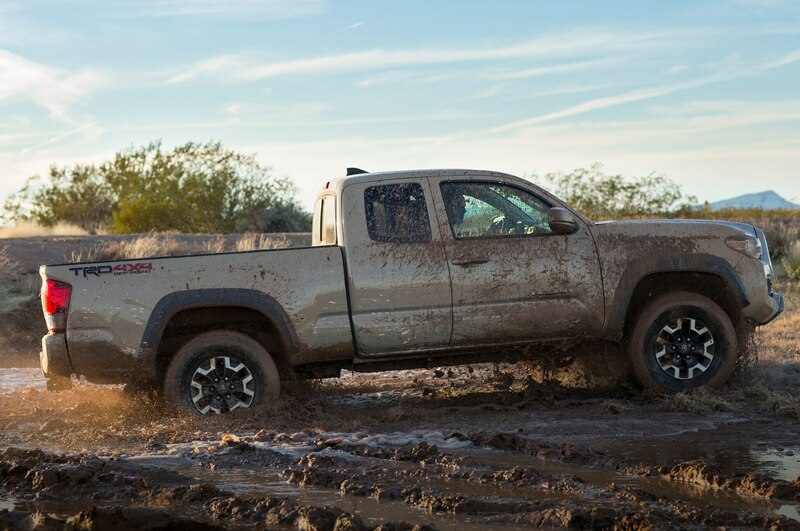 You might have heard that the 2016 Toyota Tacoma is all-new, and ready to square off against the Chevy Colorado and GMC Canyon midsize trucks. 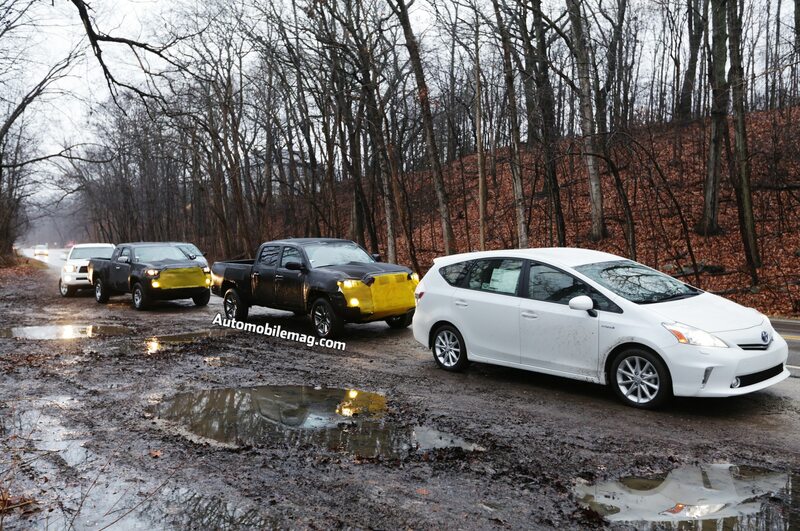 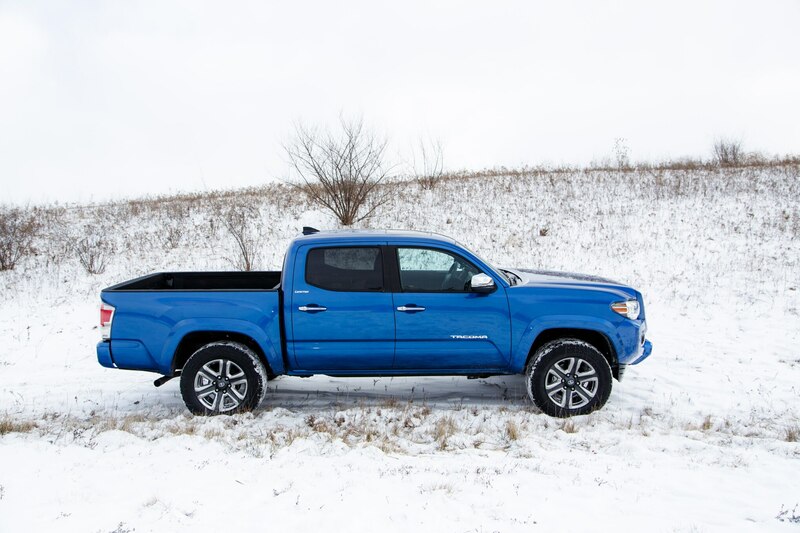 But there’s something to be said for sticking to what works, and by and large, Toyota has done just that. 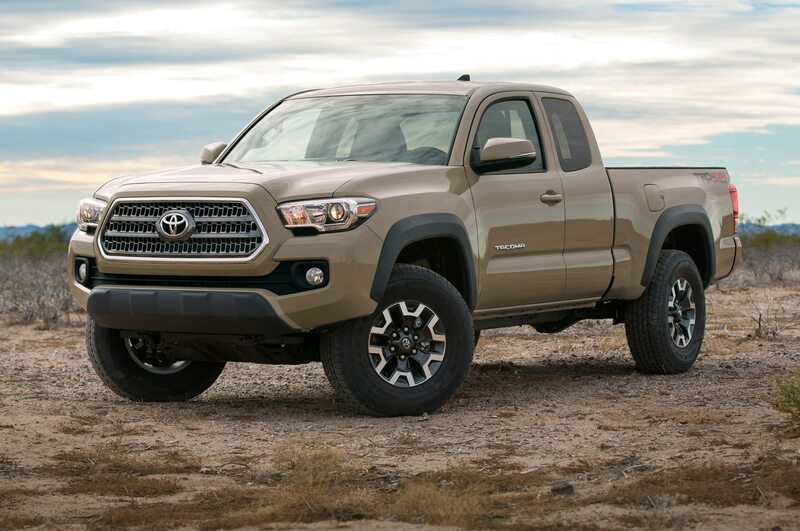 The 2016 Toyota Tacoma has an all-new body, a new engine, updated transmissions, a re-tuned suspension, and upgraded interior digs, but underneath it’s the same platform we’ve seen on the Tacoma since 2004. 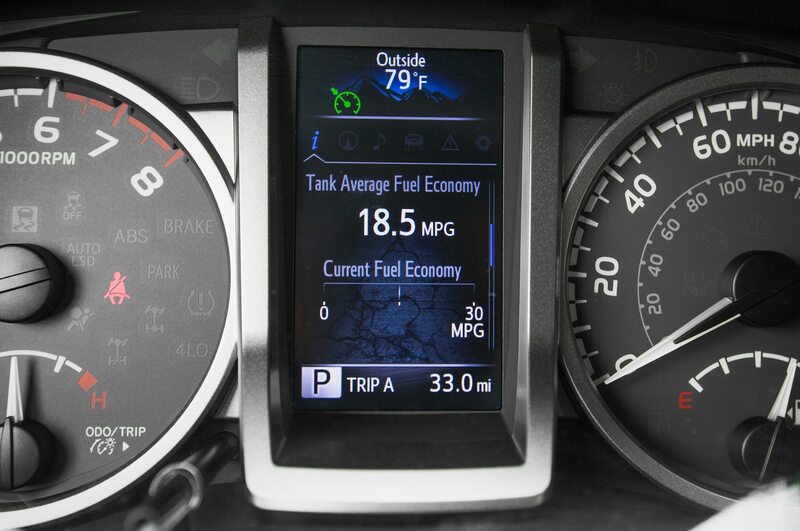 But maybe that’s not such a bad thing. 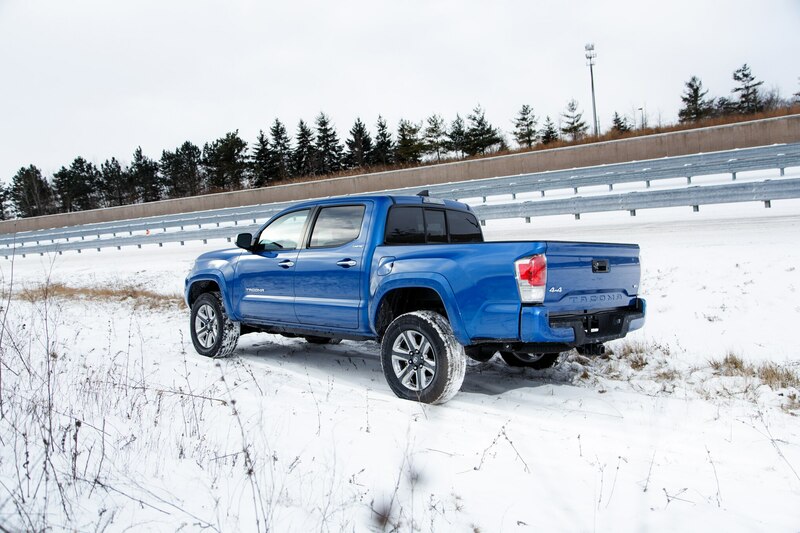 The 2016 Toyota Tacoma may not be a complete overhaul of the truck we’ve seen over the last decade, but that doesn’t mean Toyota hasn’t addressed its shortcomings. 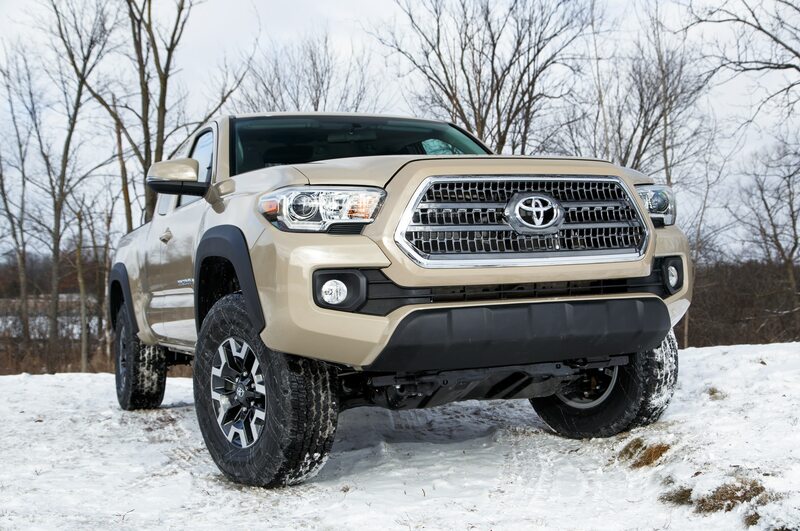 Toyota says the Tacoma’s frame benefits from added high-strength steel for improved rigidity, as well as lightweight, ultra-high strength steel for the new body shell. 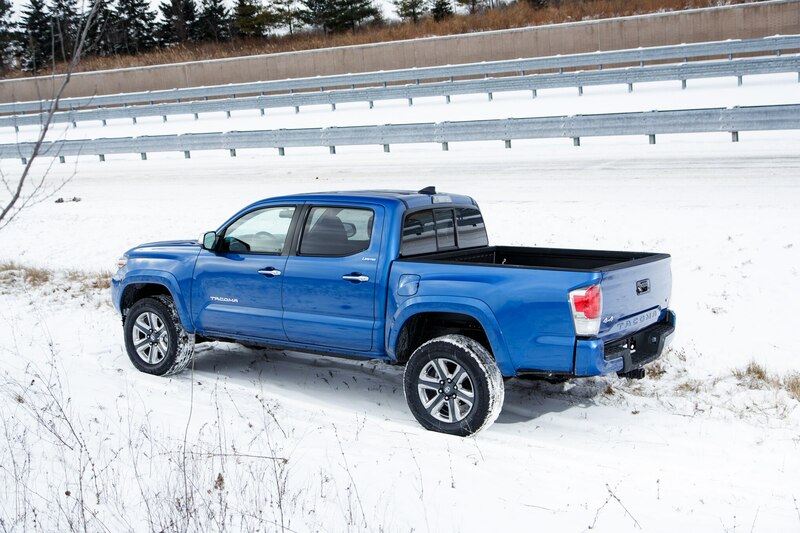 The truck should also ride better on-road and handle better off-road owing to revised suspension tuning. 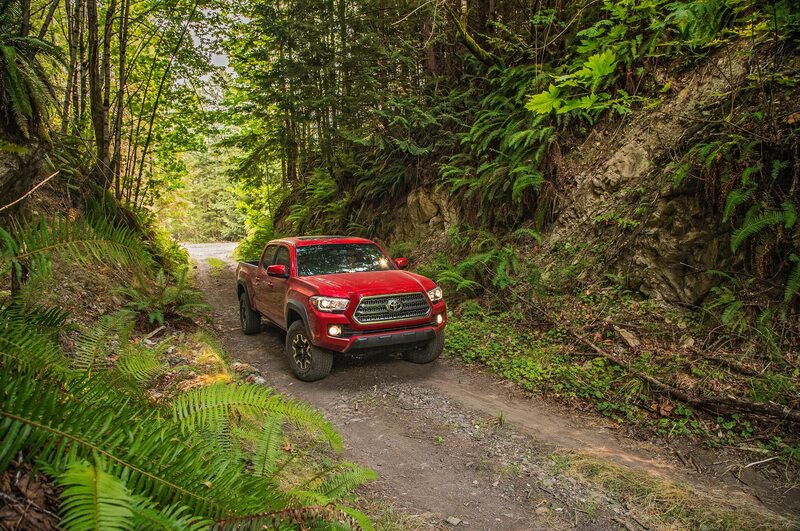 While the old Tacoma was revered for its toughness and reliability, it was frequently lampooned for its thirsty 4.0-liter V-6 engine (good for 236 hp and 266 lb-ft of torque). 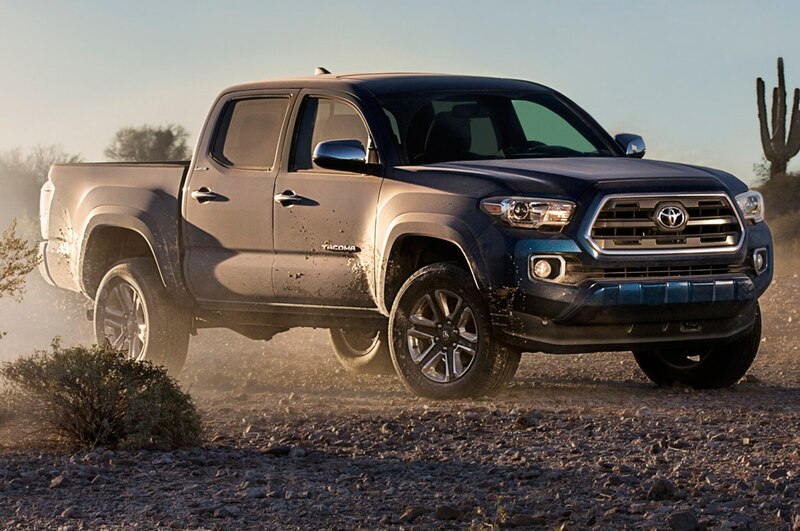 The 2016 Toyota Tacoma will instead adopt the familiar 3.5-liter V-6 engine used across the Toyota lineup in vehicles like the Camry, Avalon, Sienna, and Highlander. 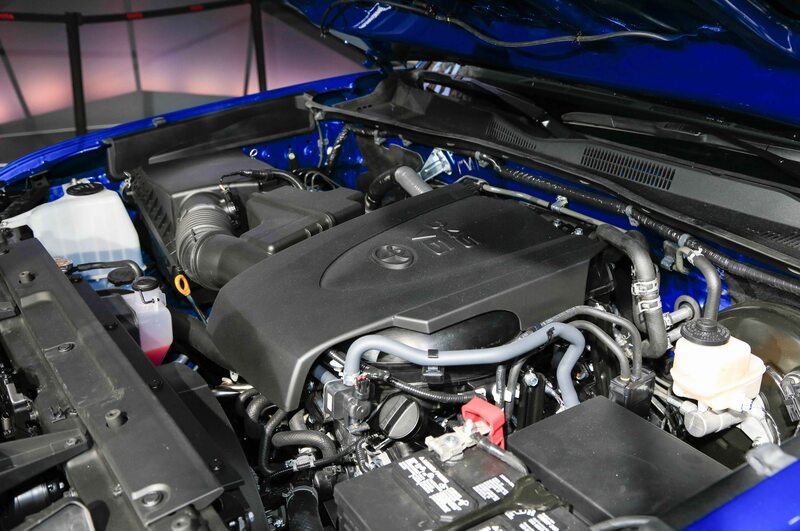 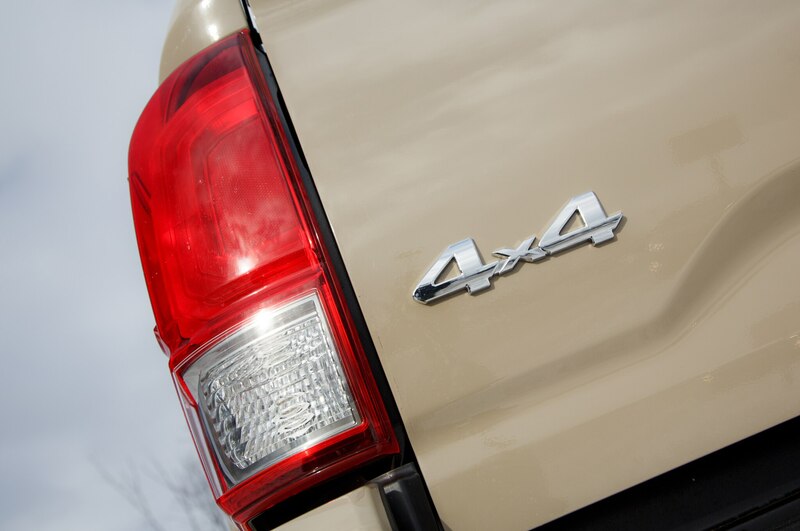 In this application, the 3.5-liter V-6 also features D-4S technology that incorporates both direct and port fuel injection. 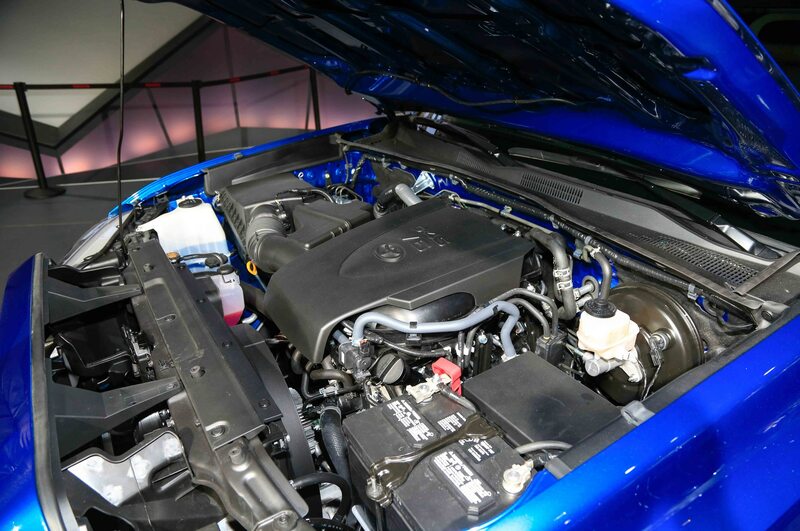 The engine’s Atkinson cycle should ensure improved fuel economy during low-strain cruising, while the combination of variable valve timing and direct injection should make sure the power is there when you need it. 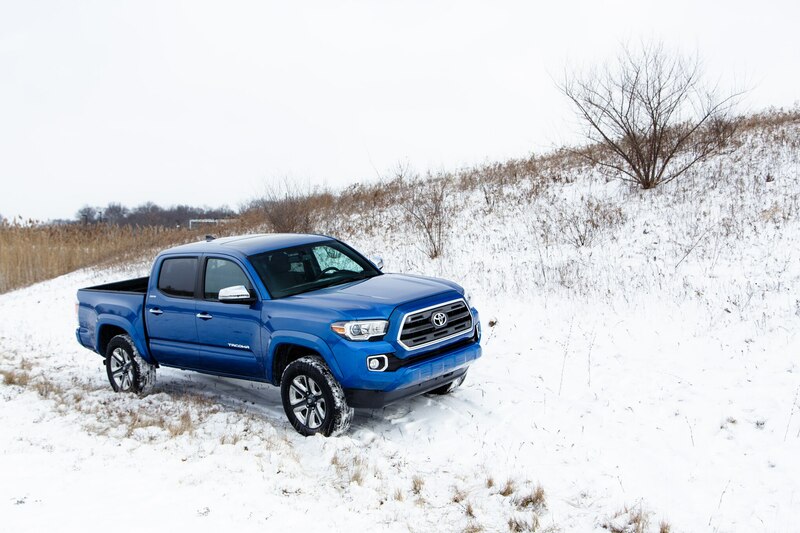 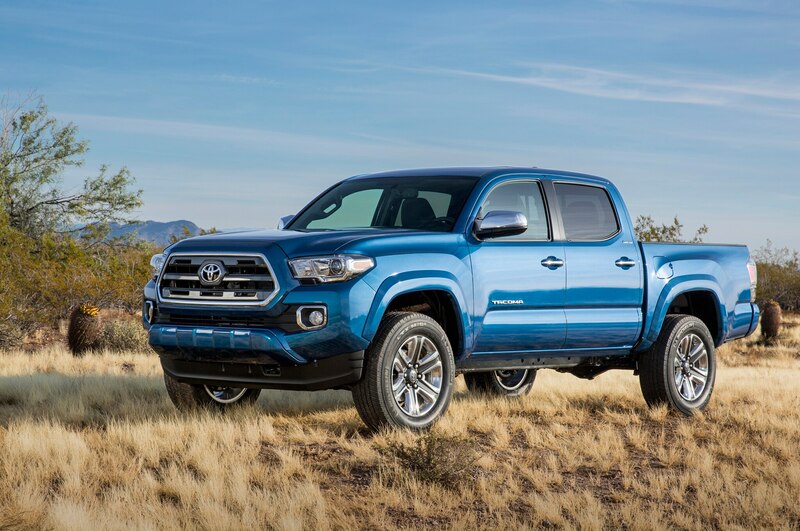 Carrying over from the last Tacoma is the same 2.7-liter inline-four engine (making 159 and 180 lb-ft of torque), but now all Tacoma models will feature available six-speed automatic transmissions. 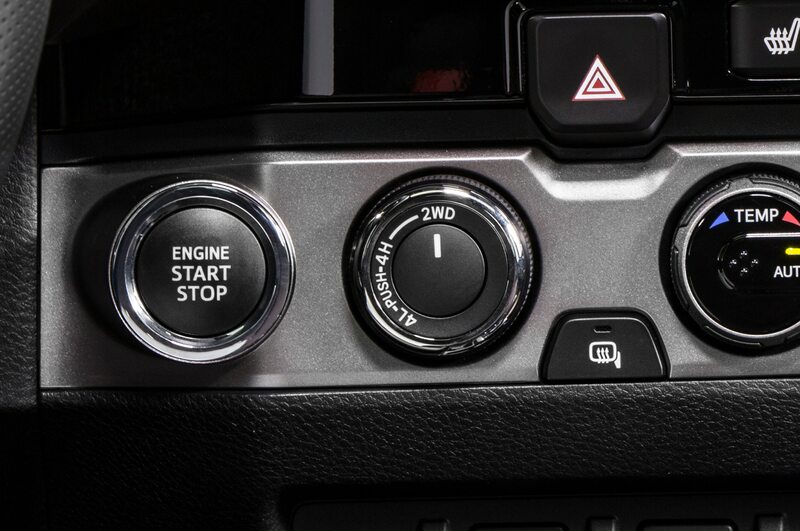 Manual gearbox options will include a new six-speed mated to the V-6, or a carryover five-speed for the four-cylinder. 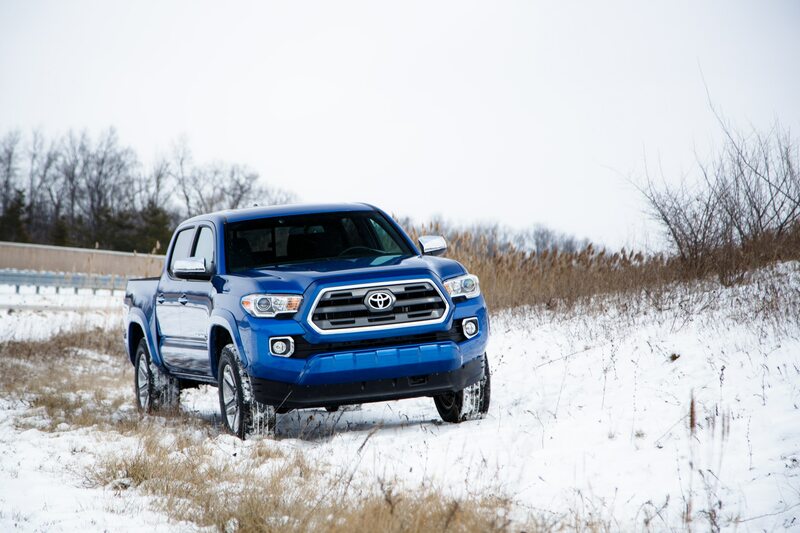 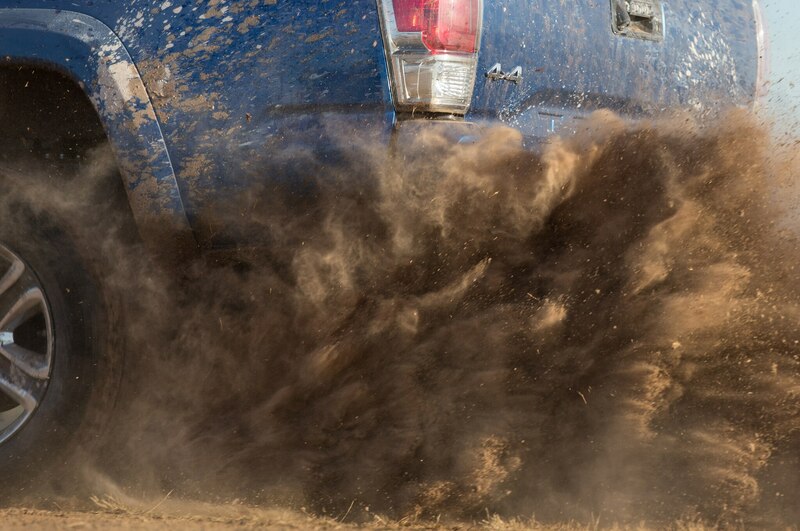 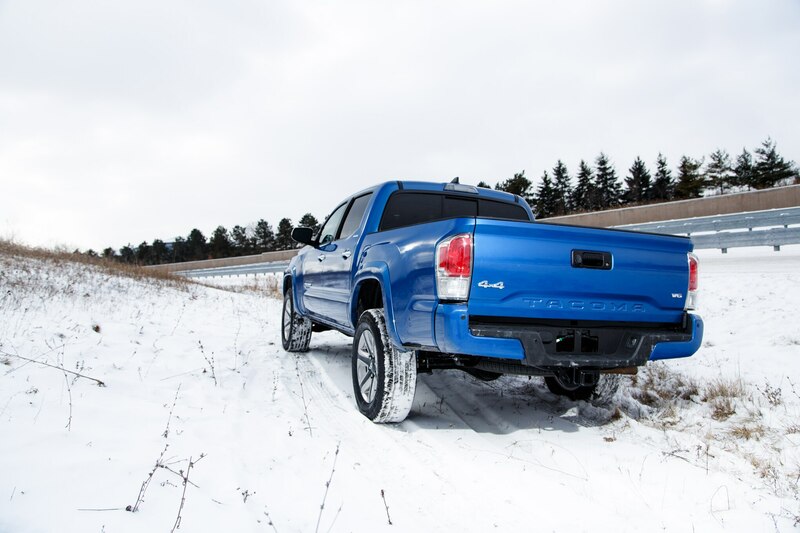 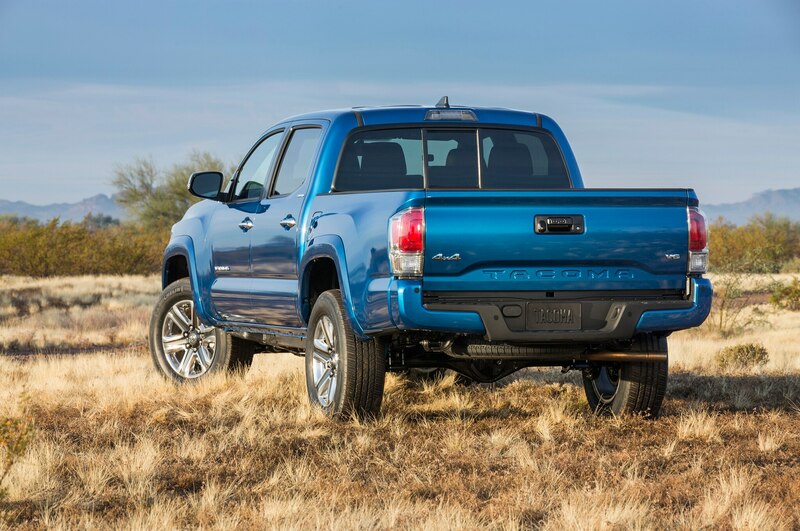 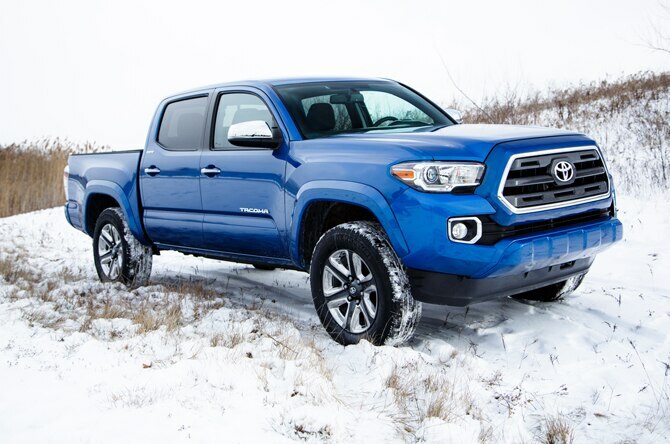 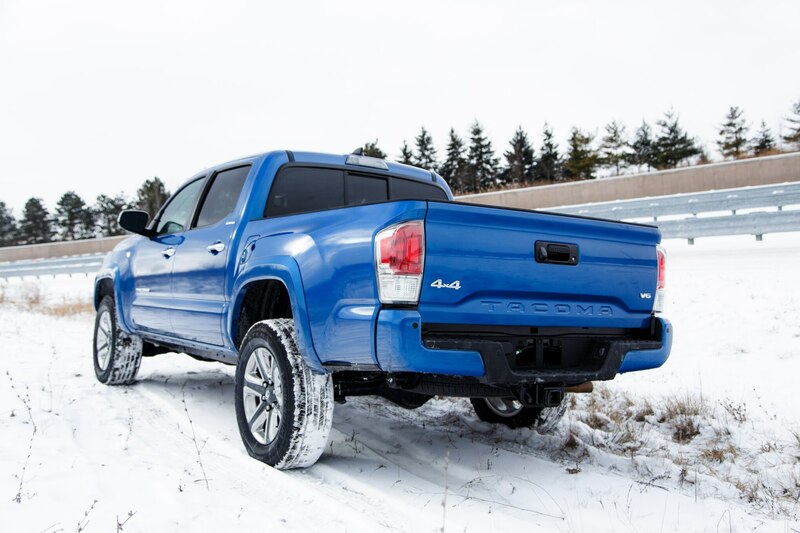 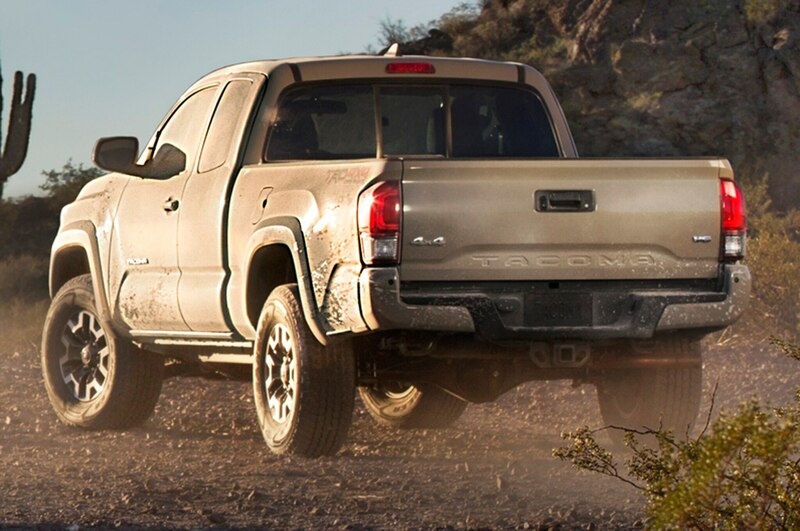 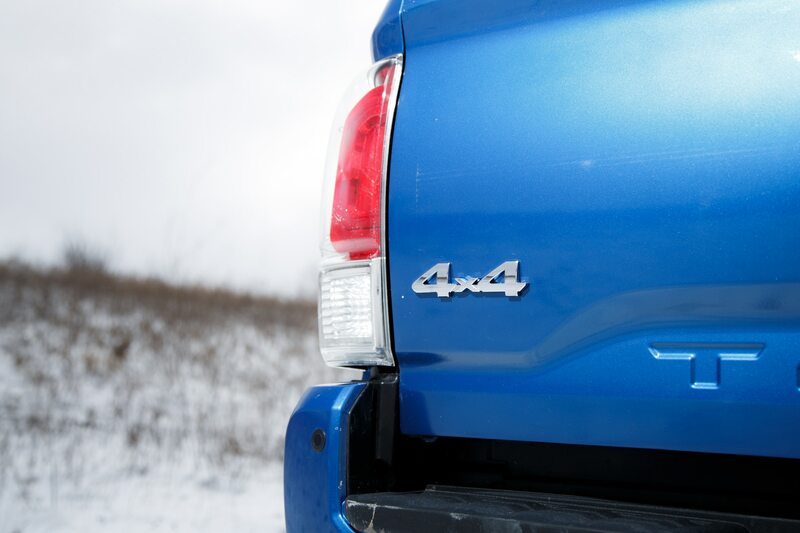 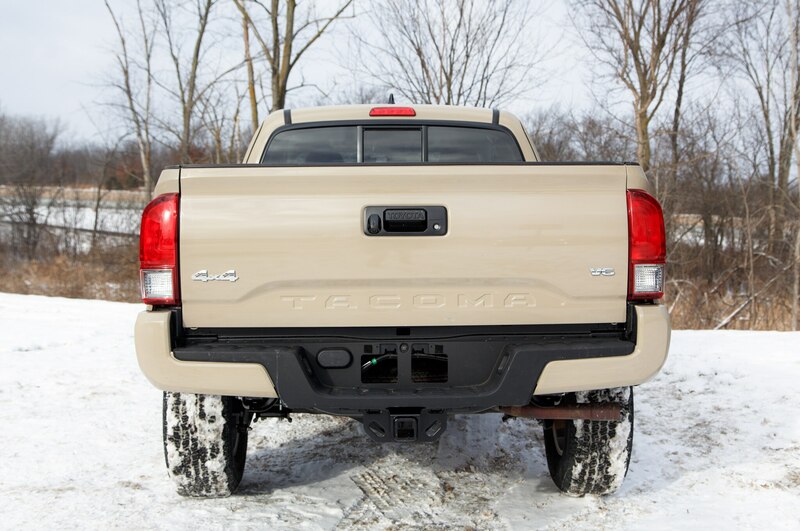 As before, the 2016 Toyota Tacoma will be available with either rear- or four-wheel drive. 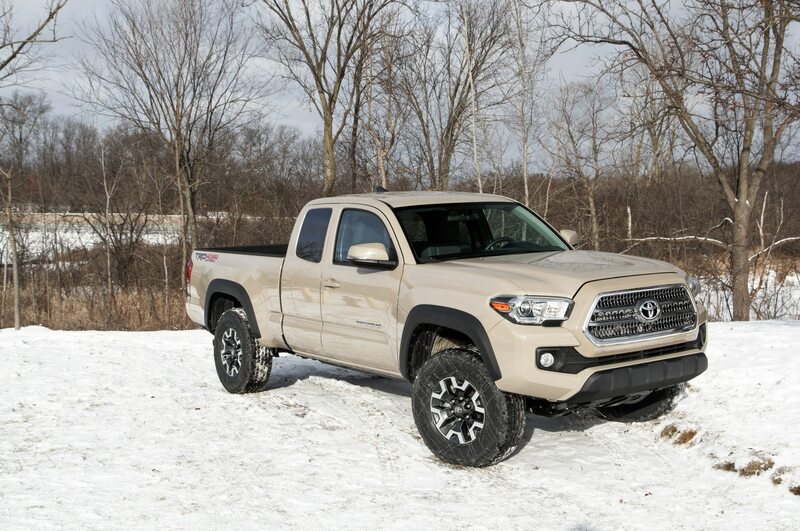 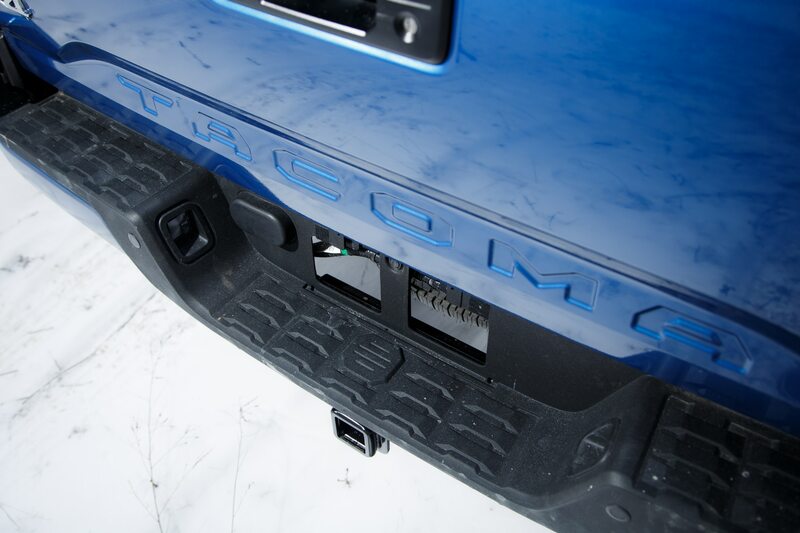 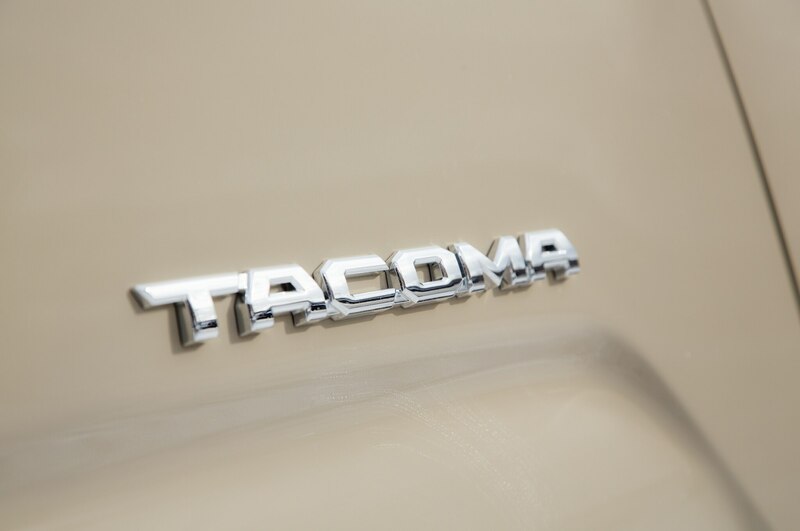 One of the best pieces of news from the Tacoma’s debut is the continuation of the Access Cab body style, contrary to earlier speculation it would be discontinued. 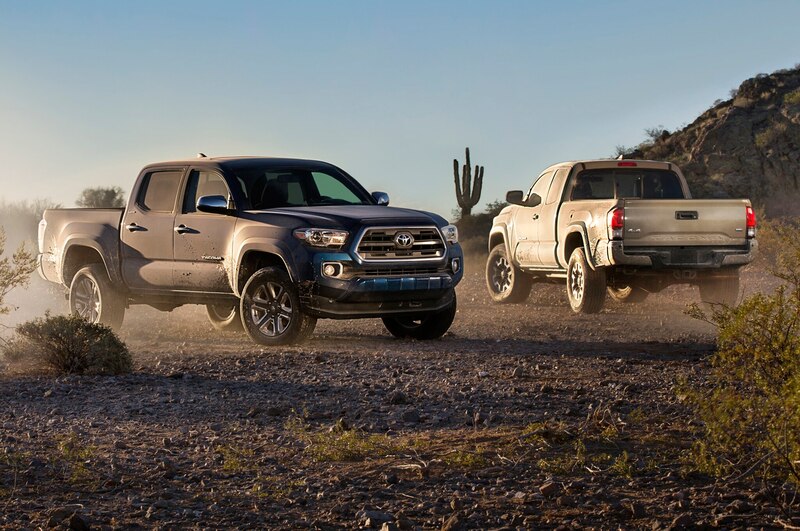 Both Access and Double Cab versions of the 2016 Toyota Tacoma will be available in five trim levels, including the base SR, SR5, TRD Sport, all-out TRD Off-Road, and range-topping Limited. 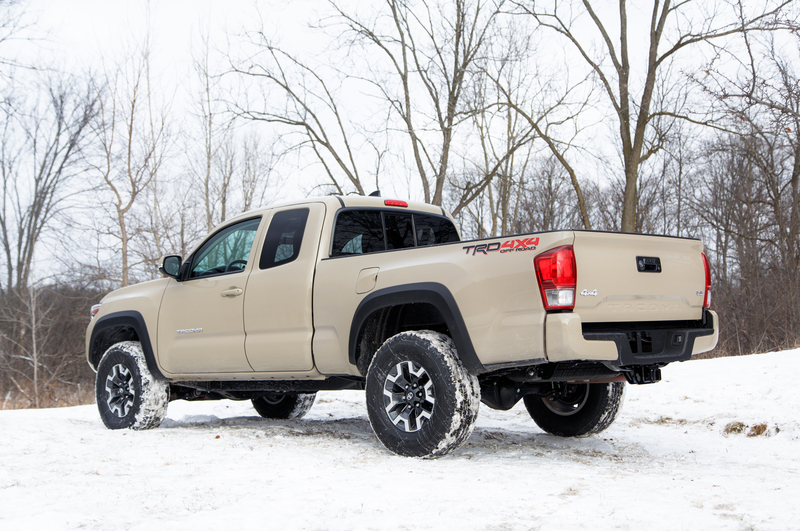 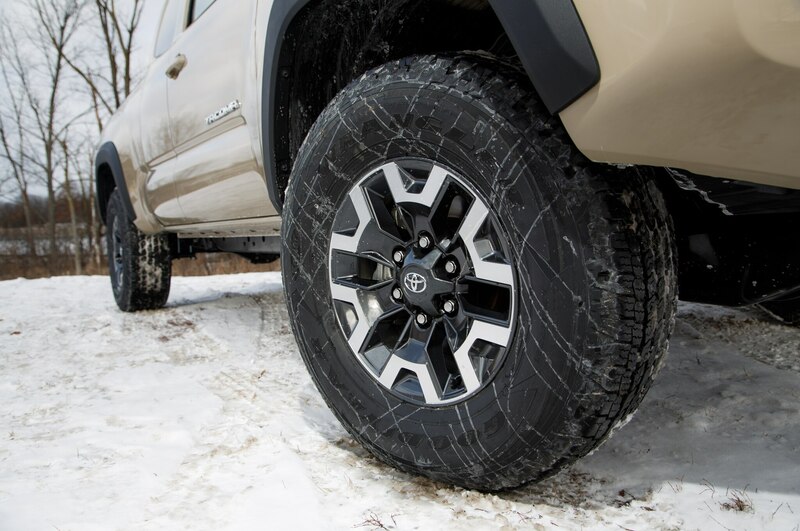 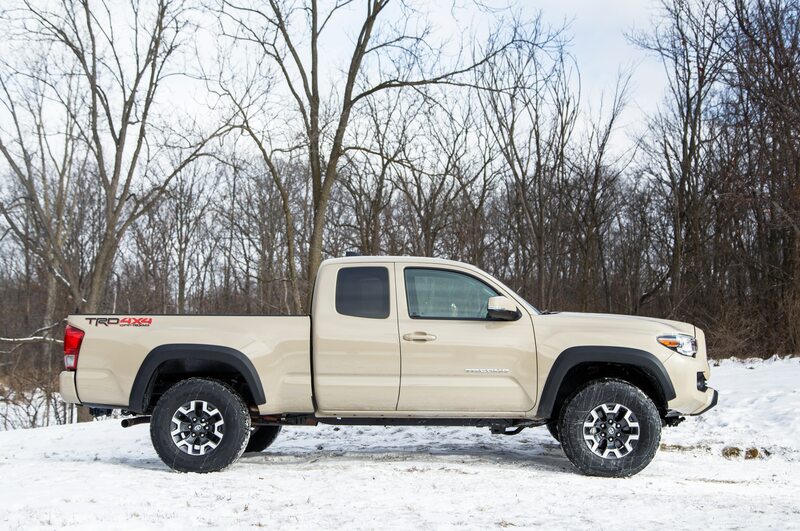 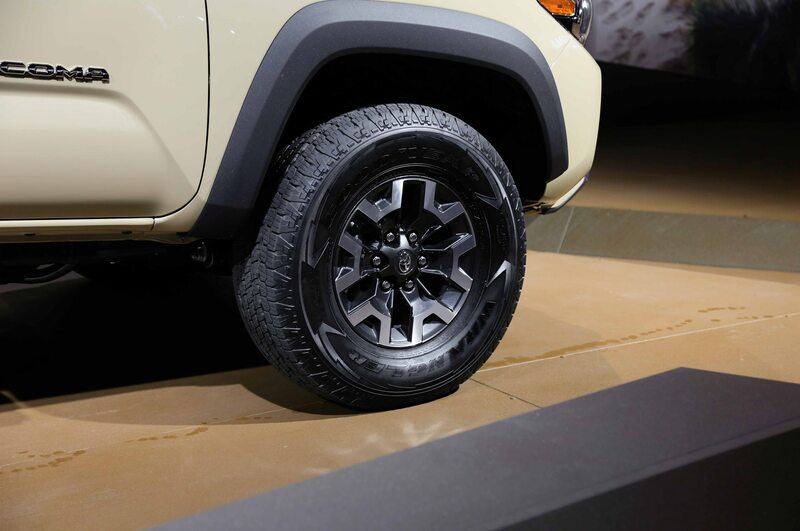 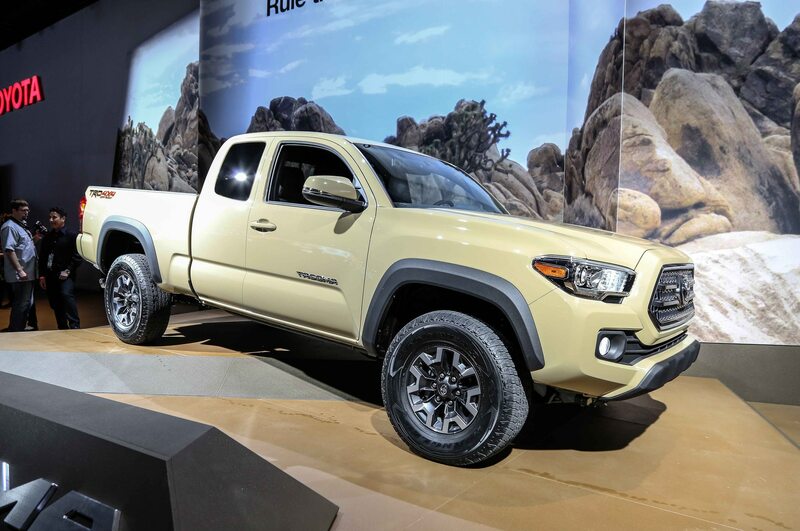 On the TRD Off-Road model, the stock tires are swapped for no-nonsense Goodyear Wrangler Rubber, the front air dam is removed to make room for a tough front skidplate, and a chrome front grille is used in place of the black unit seen on the Limited model. 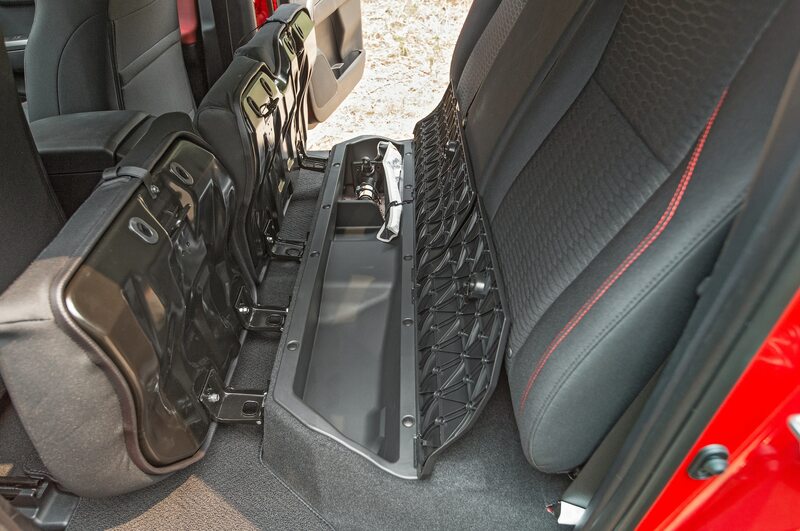 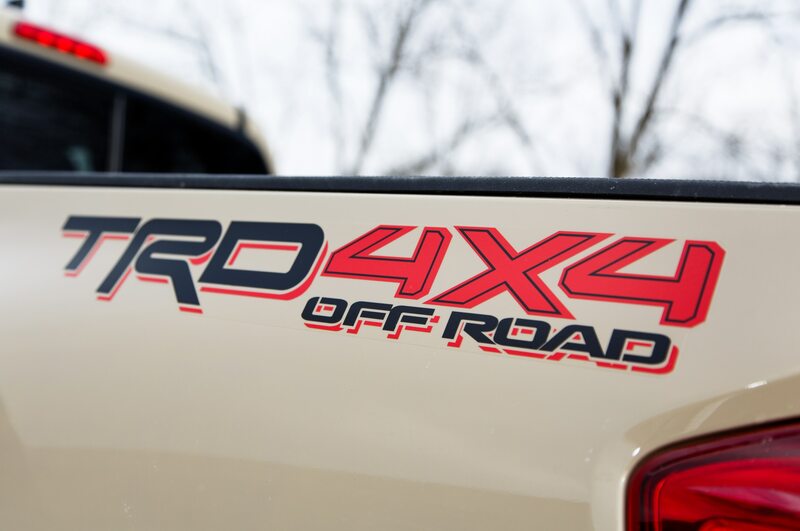 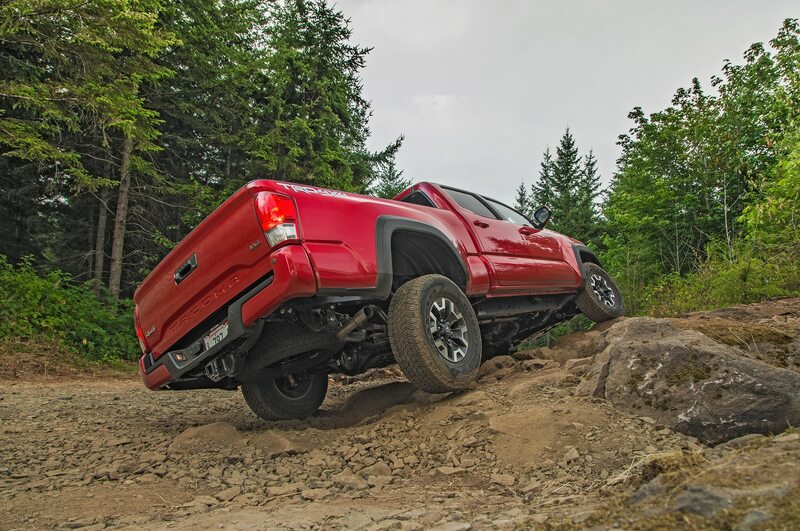 New performance features on the 2016 Toyota Tacoma TRD Off-Road like a driver-operated Multi-Terrain Select system will make the midsizer even more capable. 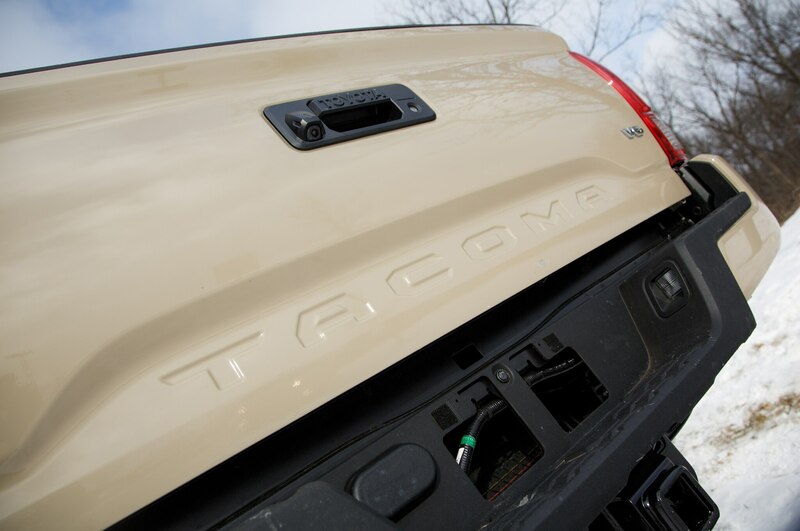 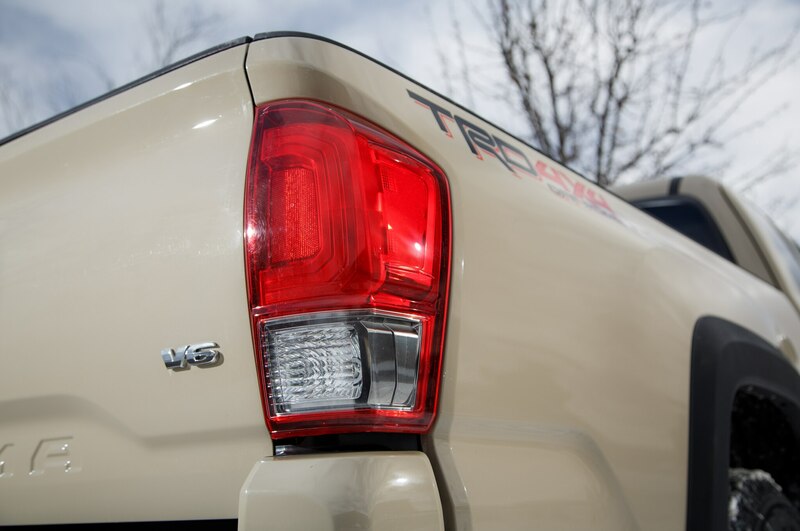 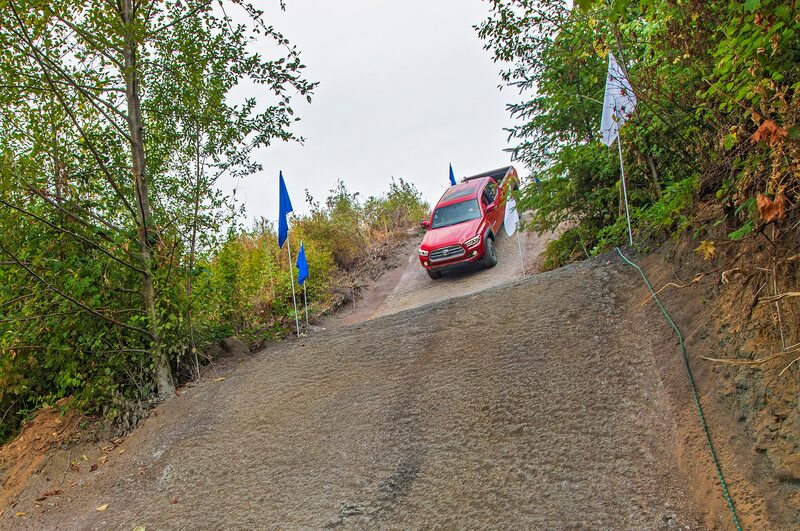 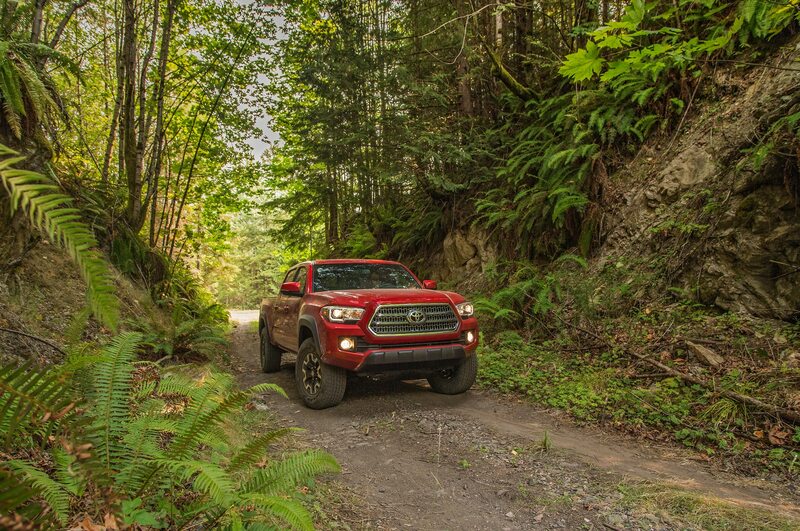 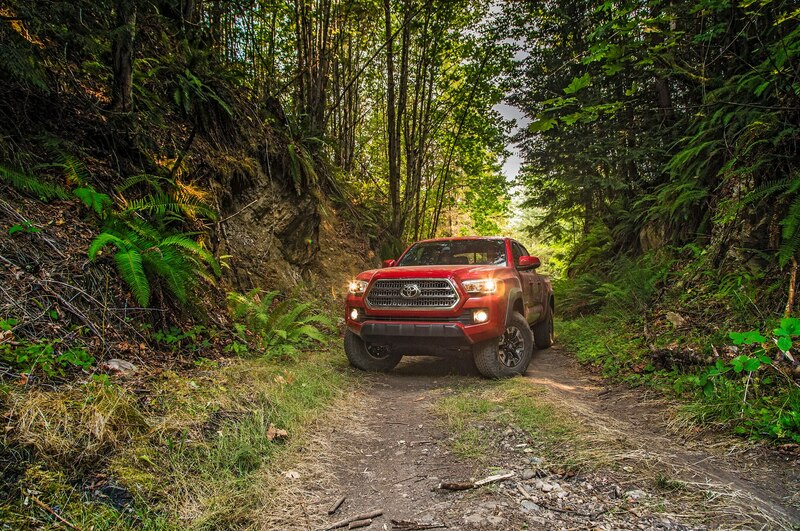 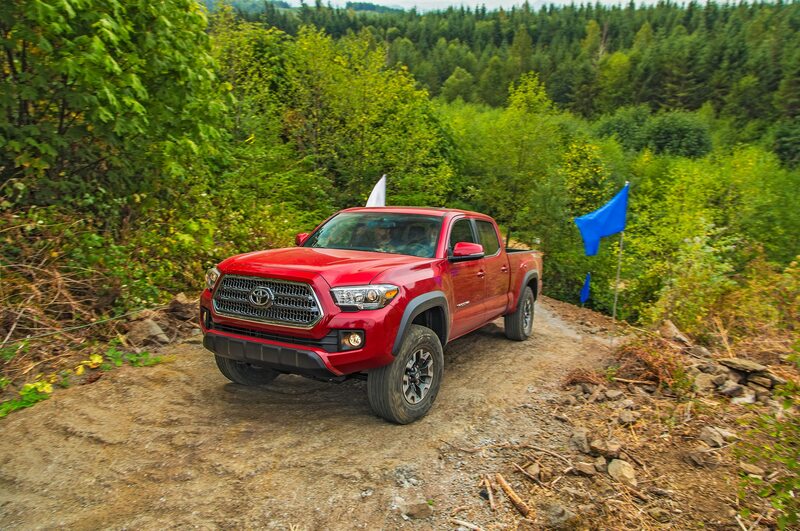 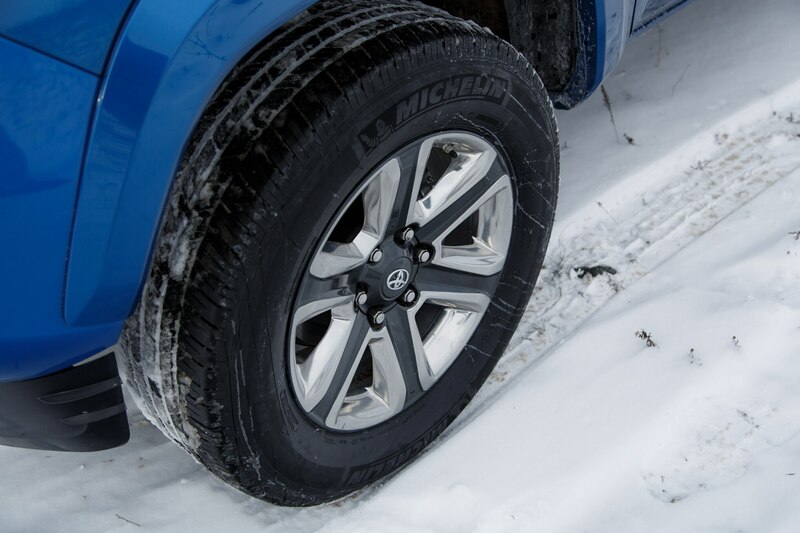 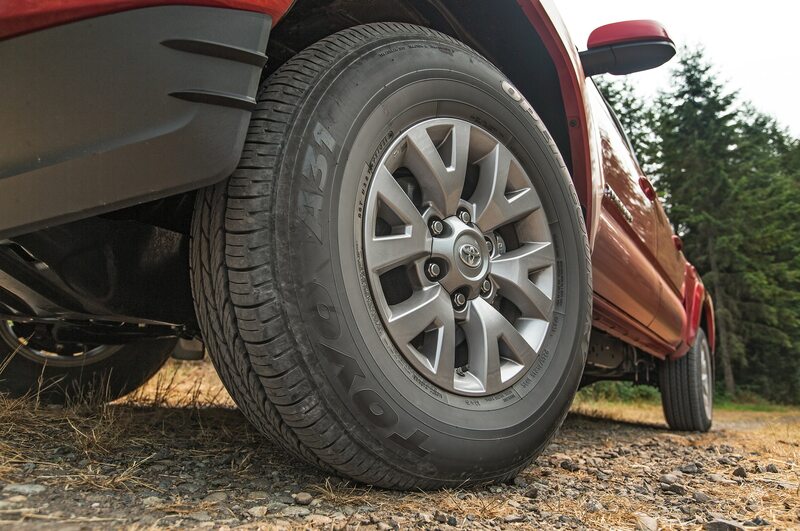 Using this system, the Tacoma can adjust throttle and brake pressure to better traverse many different kinds of terrain. 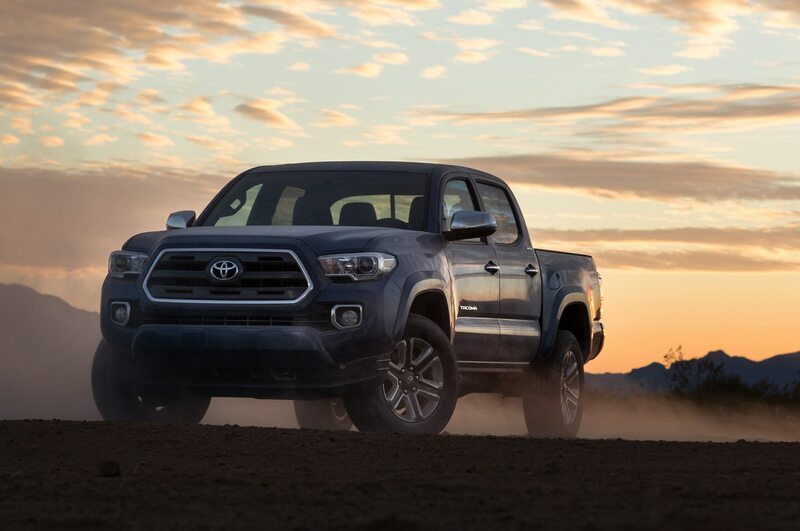 The rugged package also contains Toyota’s automatic limited-slip and locking rear differential, hill-start assist, and Crawl Control. 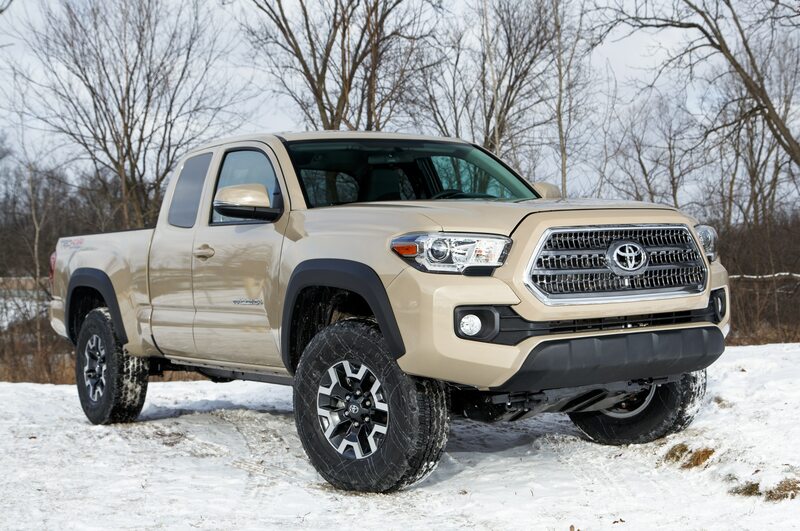 This trim level will be the toughest of the bunch, unless Toyota decides to revamp the TRD Pro Tacoma for the current generation. 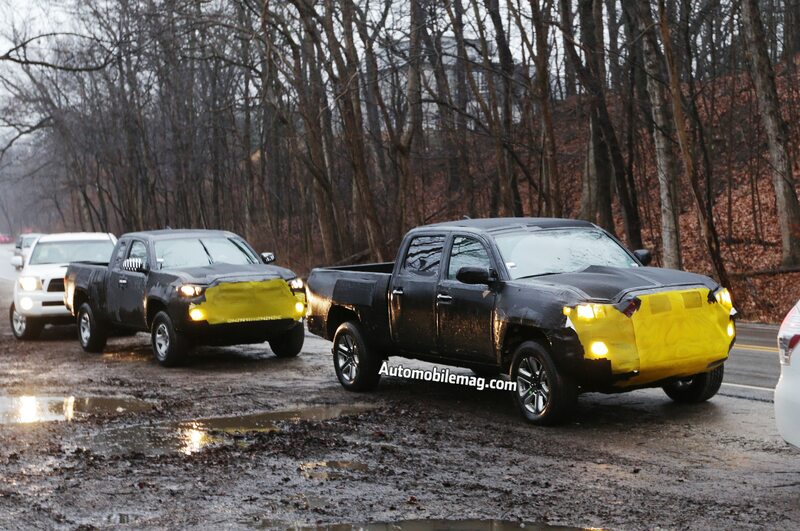 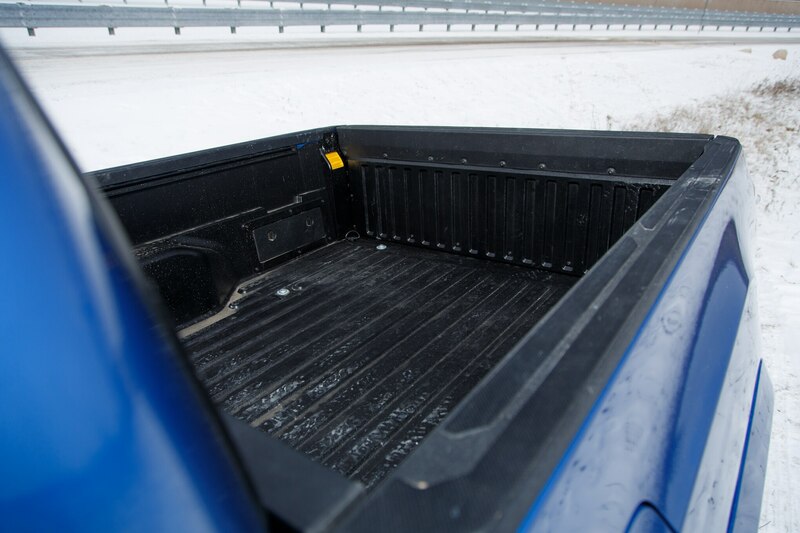 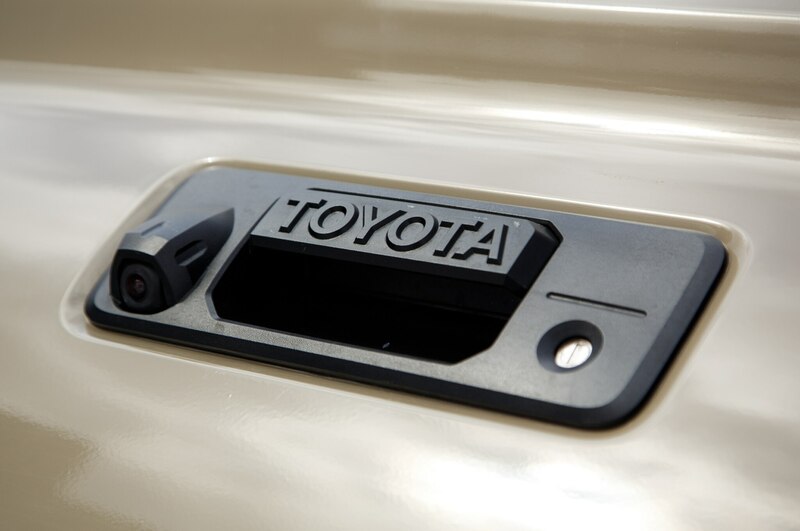 We saw the 2016 Toyota Tacoma Double Cab break cover at the Toyota Technical Center late last week. 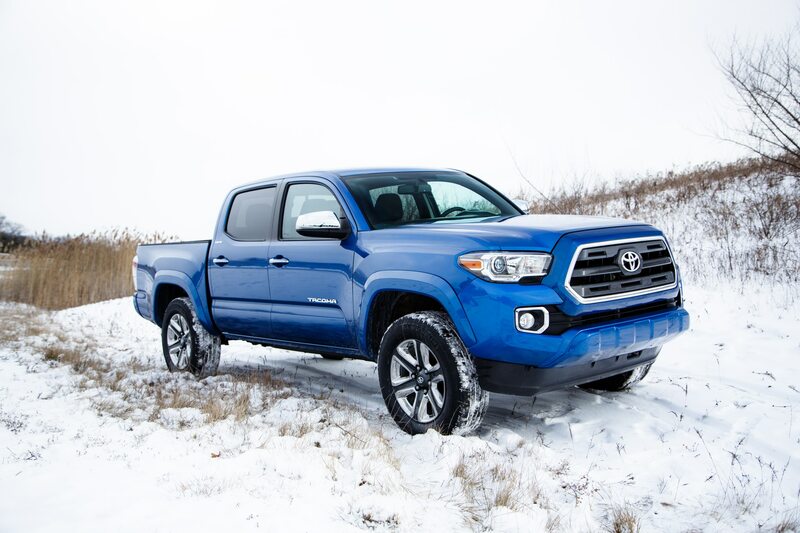 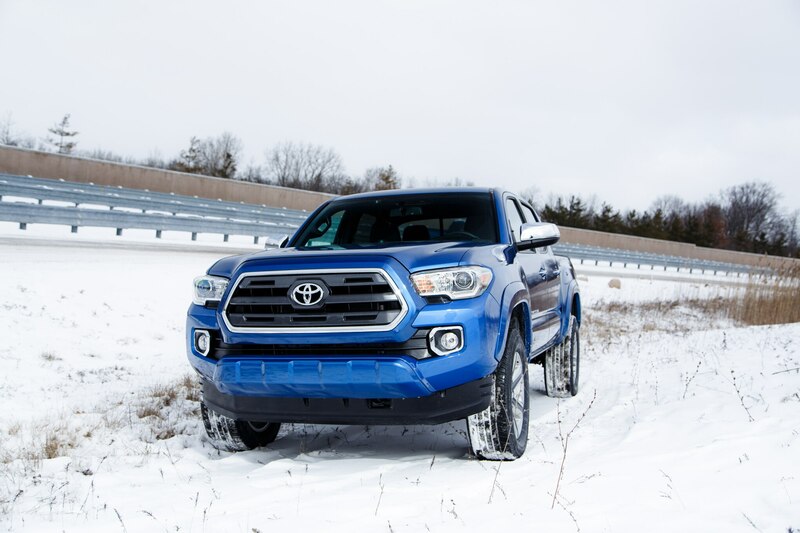 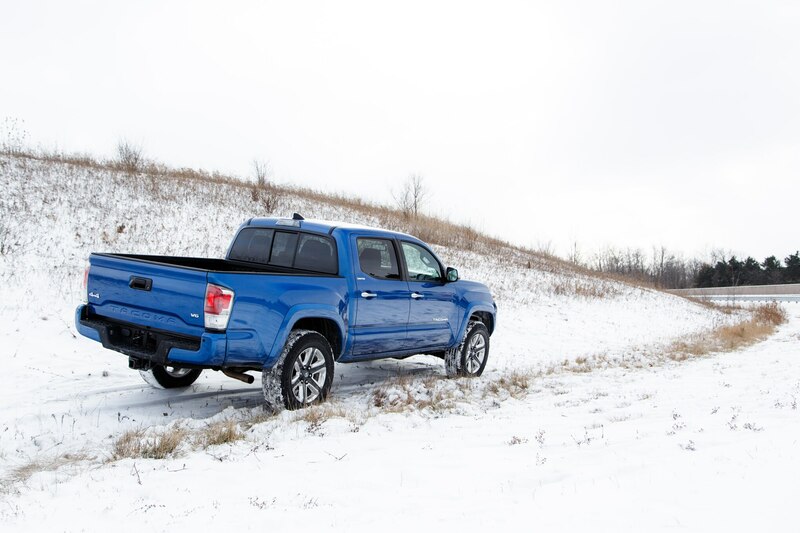 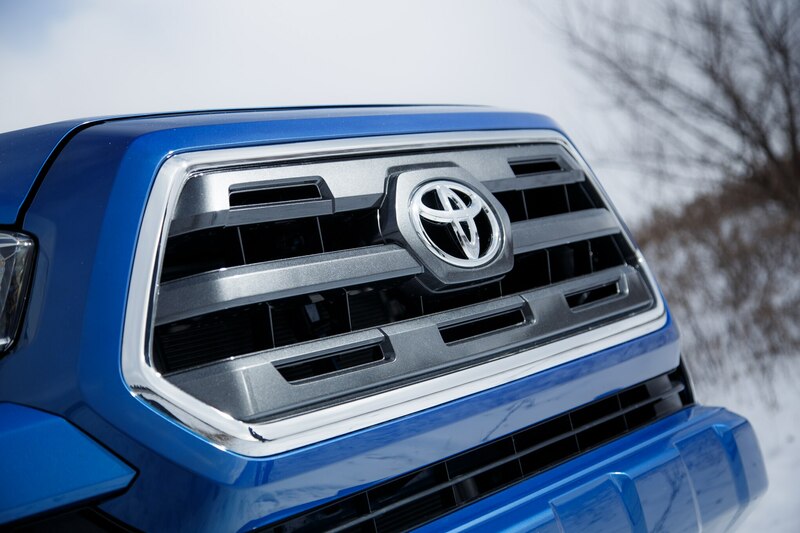 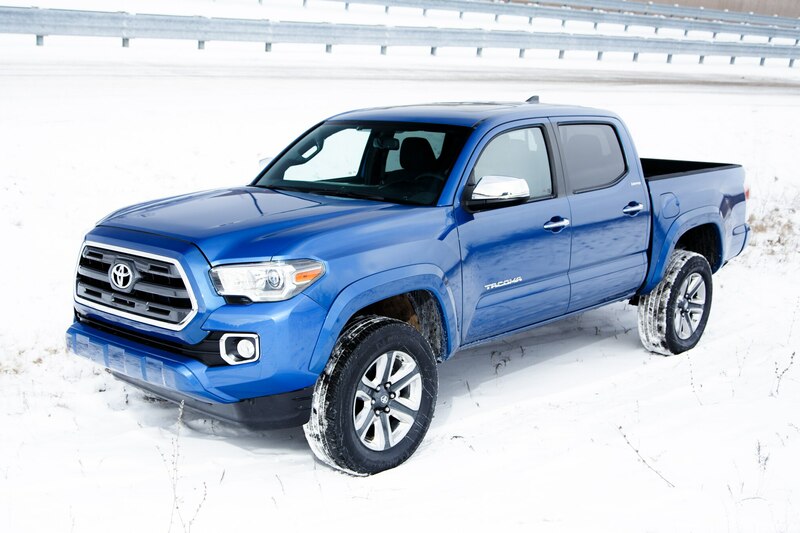 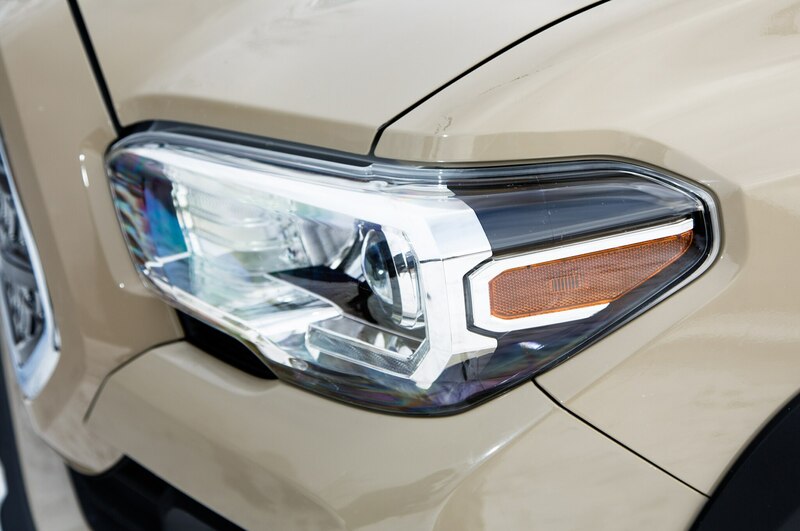 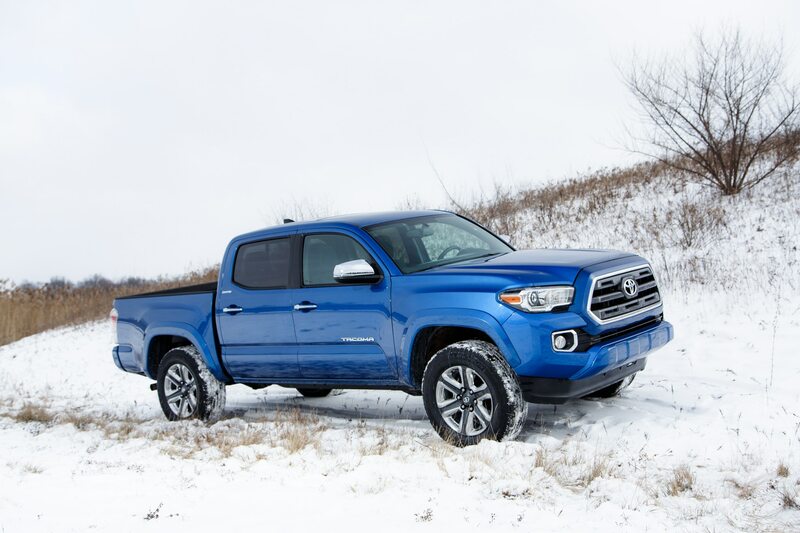 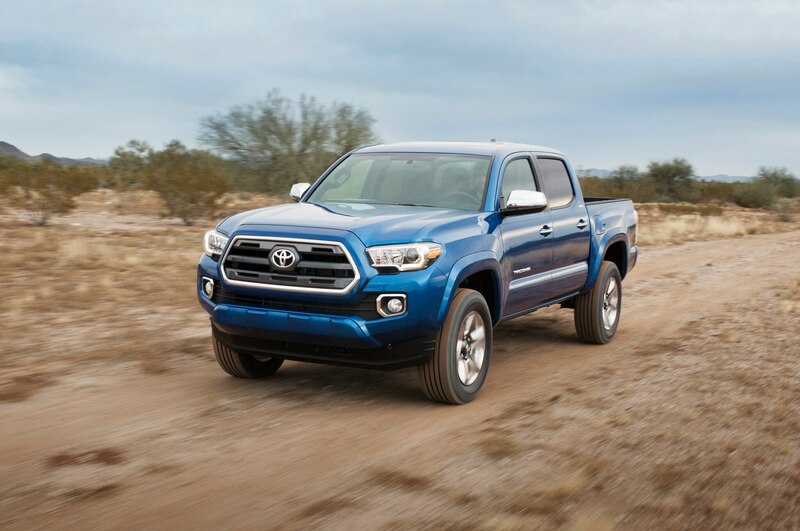 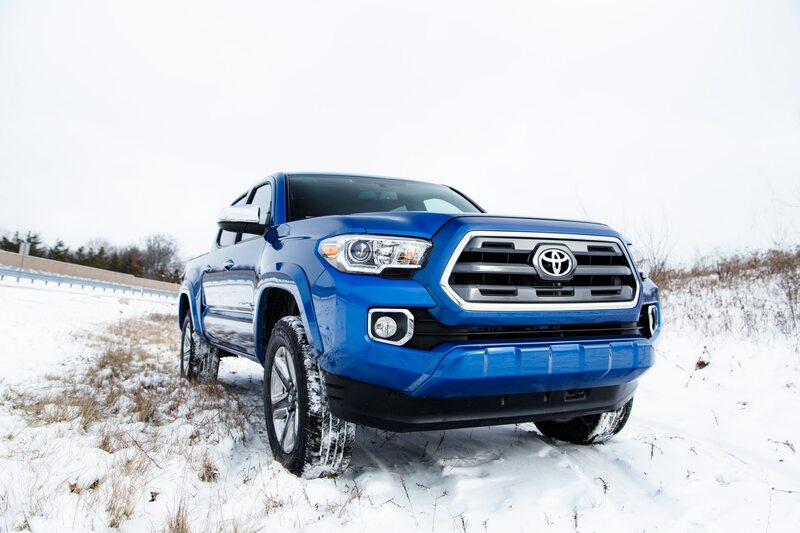 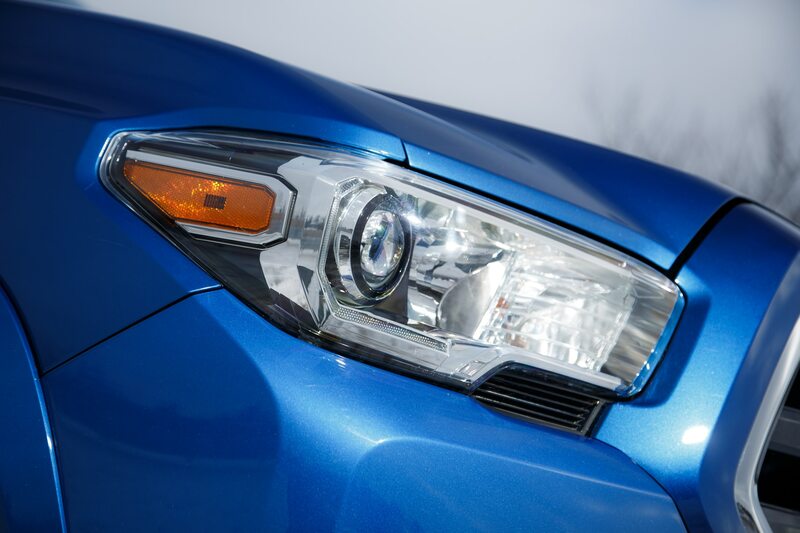 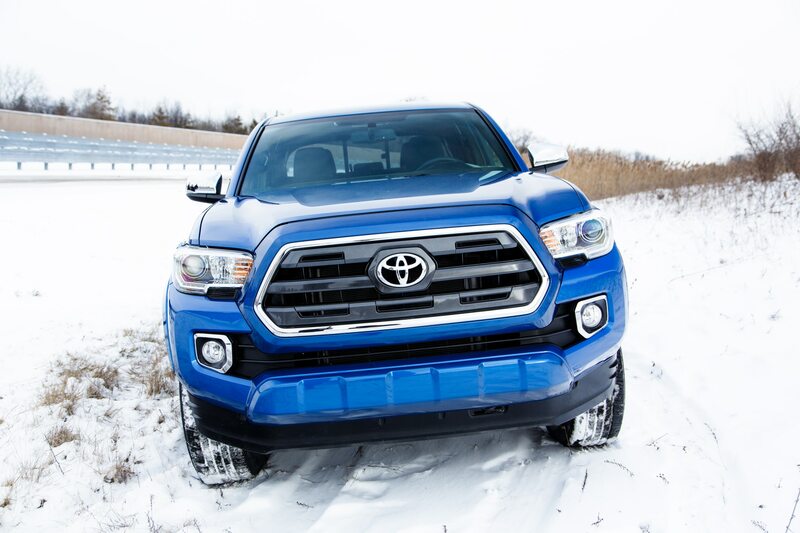 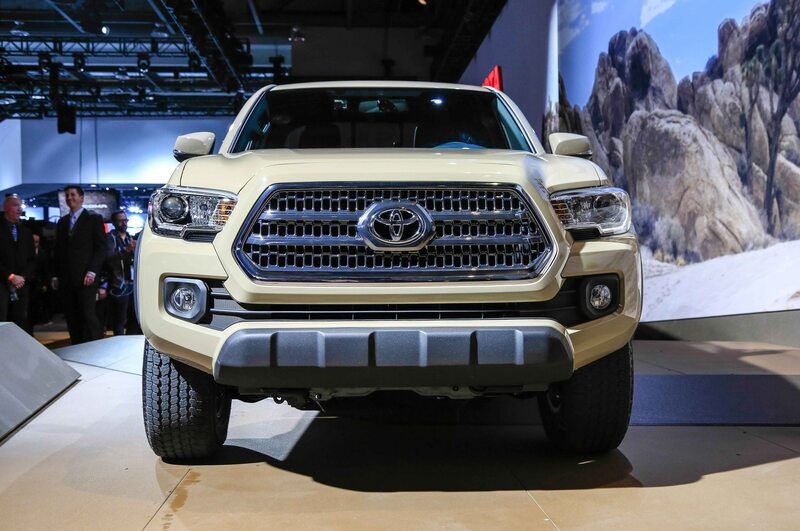 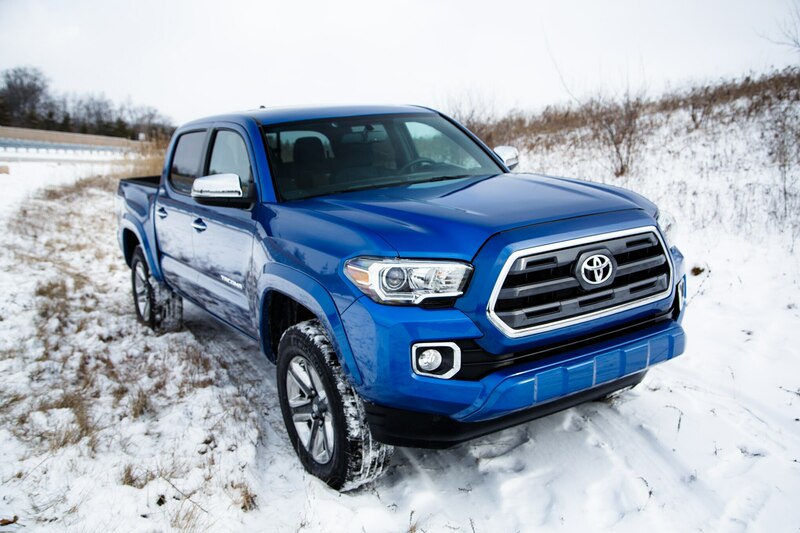 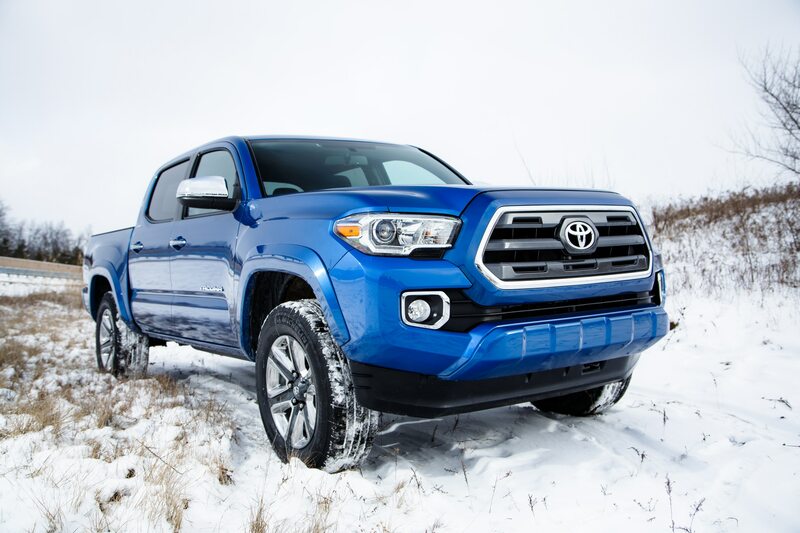 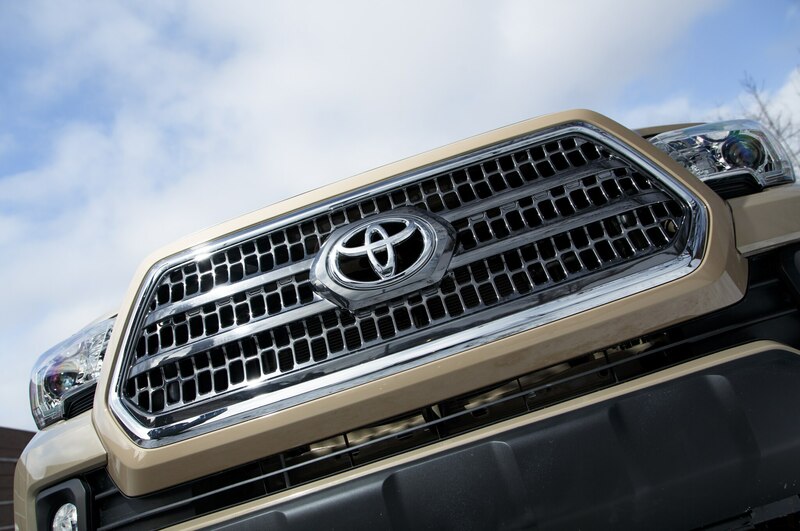 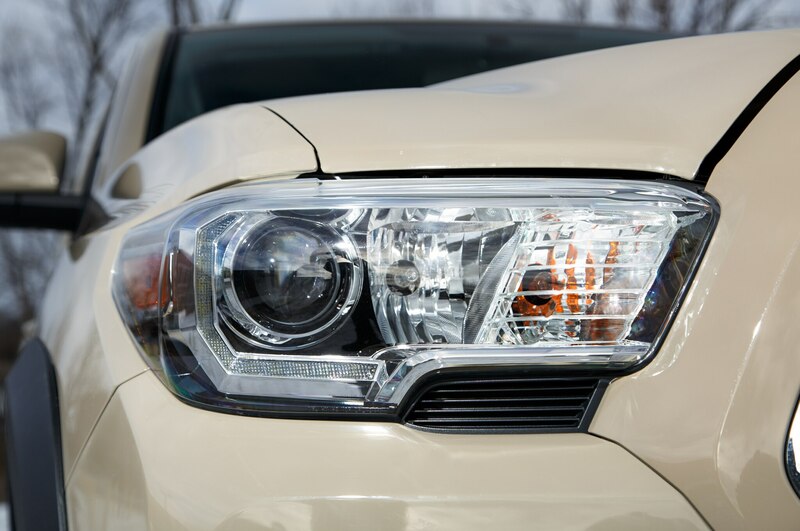 Prominent upgrades compared to the outgoing Tacoma include a new hexagon-shaped grille, a taller hood with a more pronounced hood, projection beam headlights with available LED daytime running lights, and a Tacoma-stamped rear liftgate with an integrated spoiler. 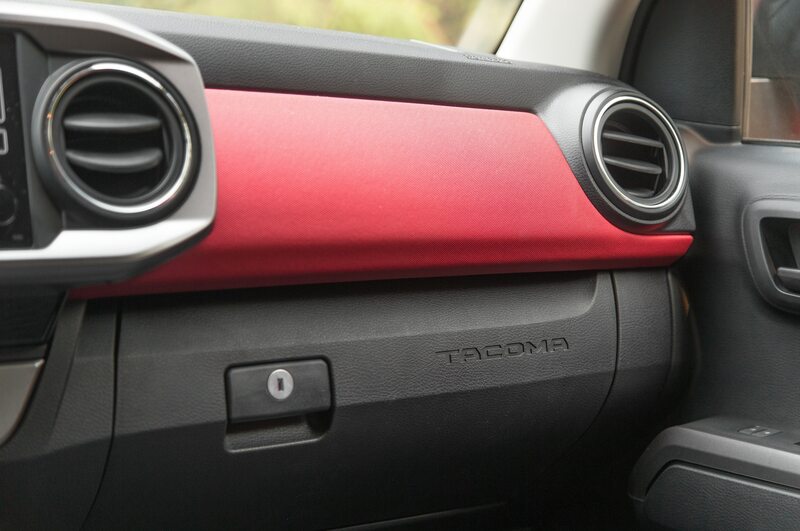 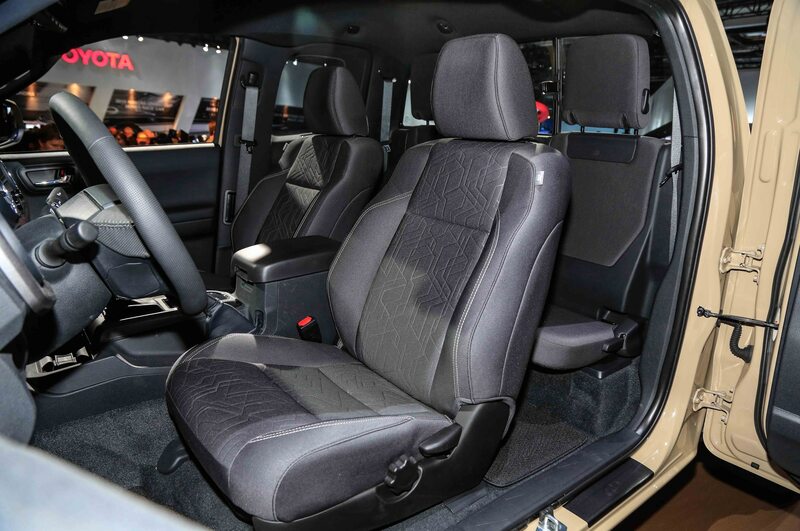 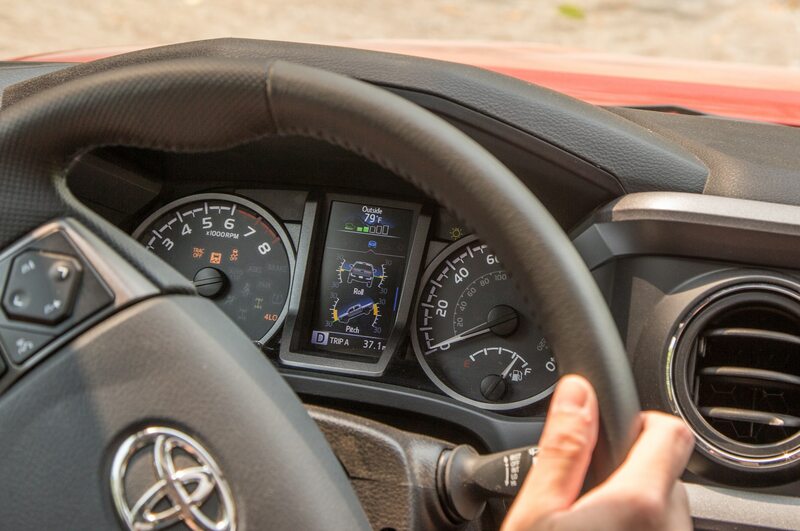 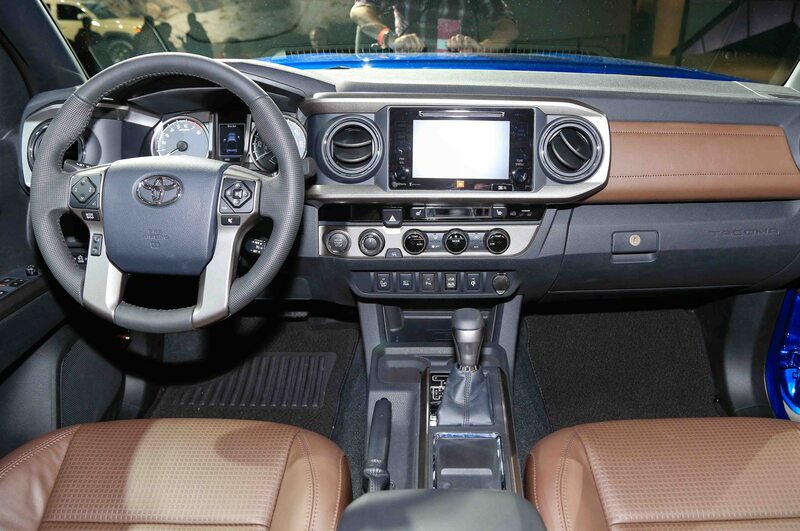 Interior niceties like wireless phone charging, an improved touchscreen infotainment system, dual-zone climate control, moonroof, push-button start, leather-trimmed seats, and blind-spot monitoring with rear cross traffic alert will all be available on the 2016 Toyota Tacoma. 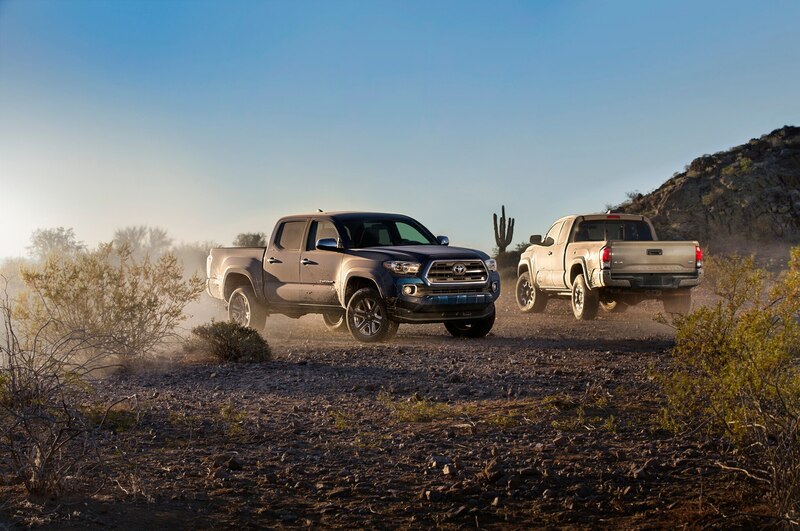 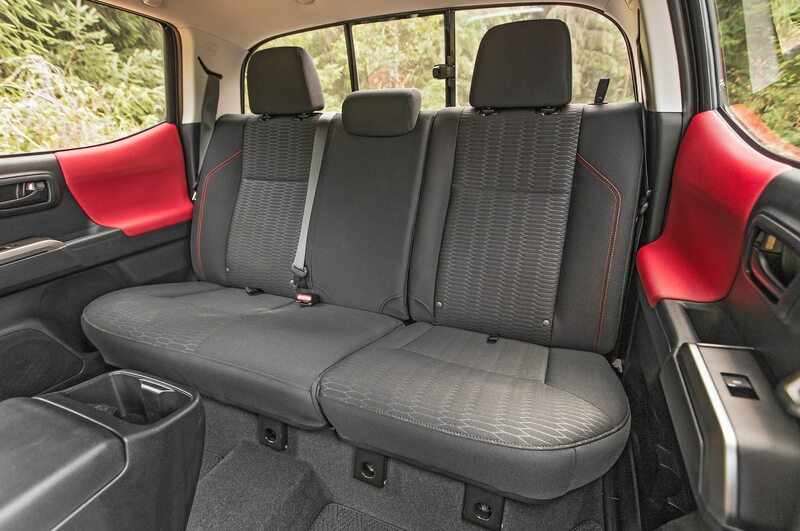 While there was nothing egregiously lackluster about the last Toyota Tacoma compared to its contemporary competition, there’s no doubt that GM’s well-executed interiors on the Canyon and Colorado forced Toyota to step up its game. 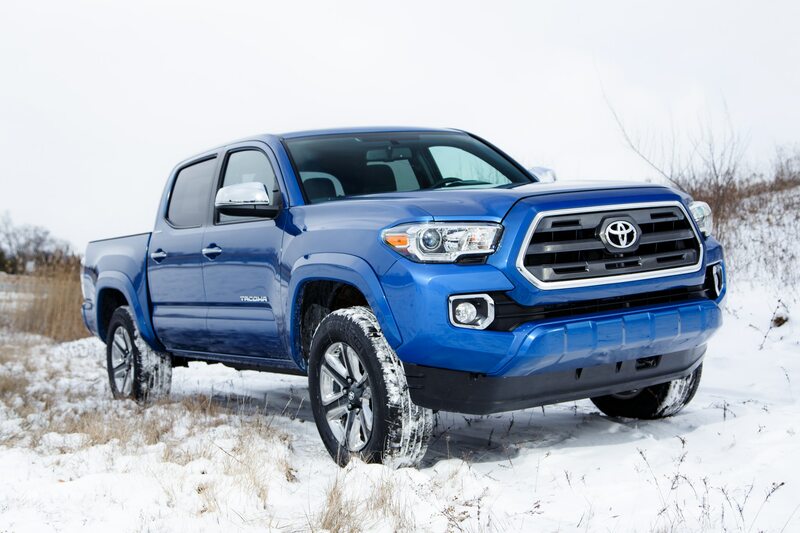 Toyota has not yet released pricing information or performance figures for the 2016 Toyota Tacoma, but we’ll be sure to pass those things along when they become available. 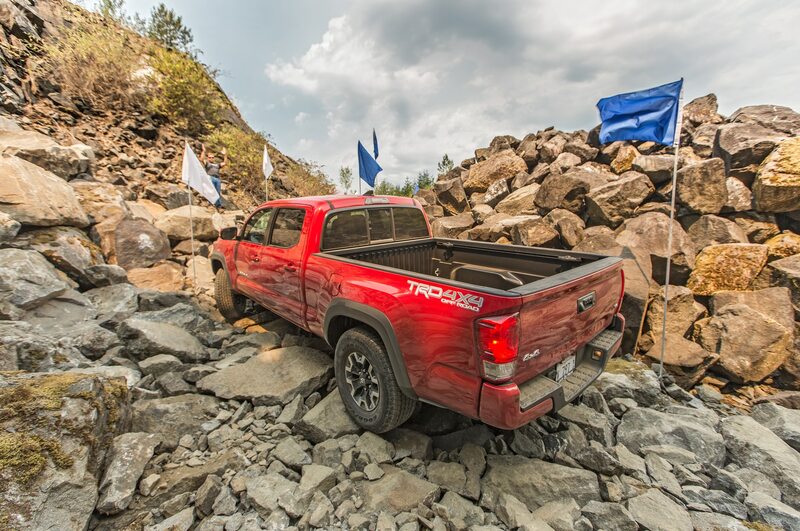 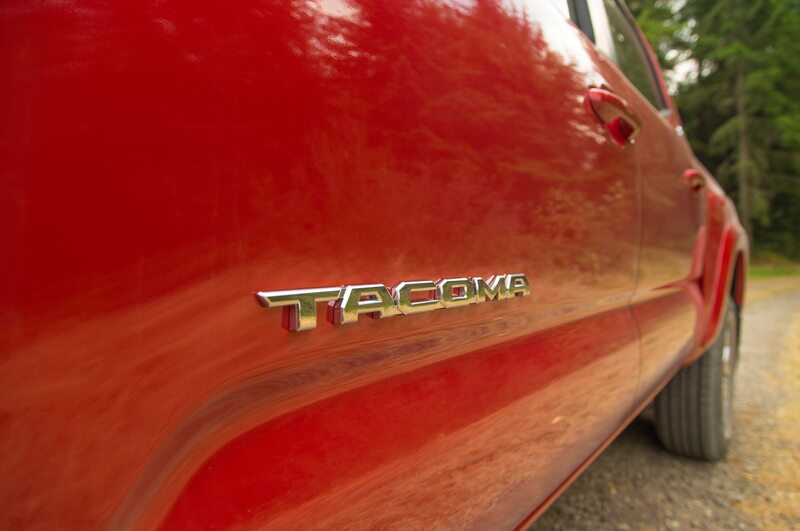 The 2016 Toyota Tacoma will be available in showrooms this fall.